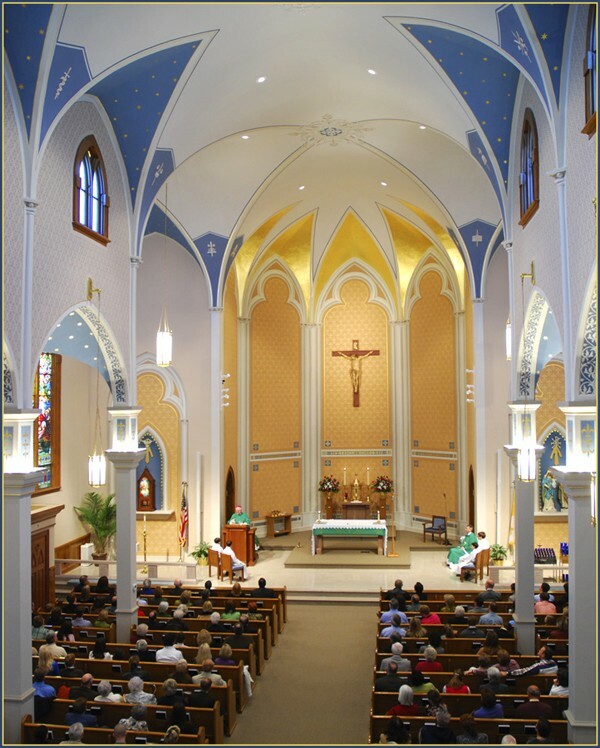 Originally built in 1835 and called St. Philip and James, the parish was relocated to the current site and dedicated May 12, 1880 and renamed The Church of The Holy Family. 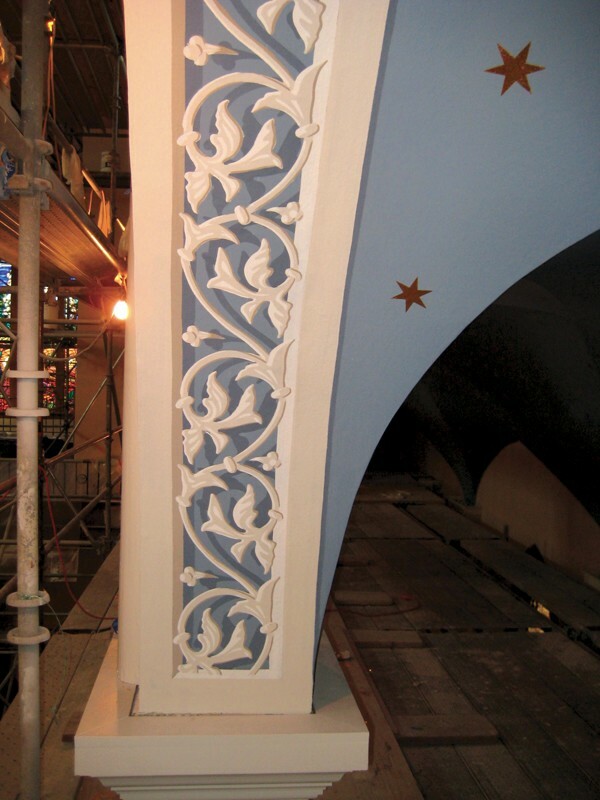 The Gothic and Byzantine architecture was designed by Daniel Foley, an Irish-born architect. 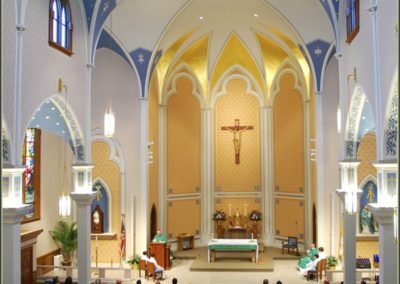 The historic church in Columbus Ohio, recently rededicated the sanctuary after nine months of renovations. 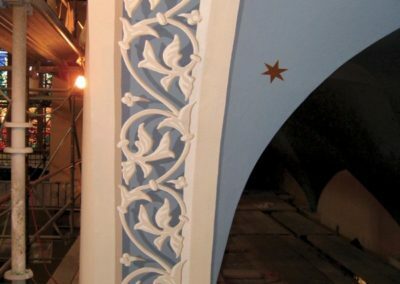 Conrad Schmitt Studios spearheaded the massive effort which included new paint and stenciling on the ceiling and walls; new stained glass; improved lighting and acoustics; new ambo and ambry; and a new hand-carved crucifix from Italy. 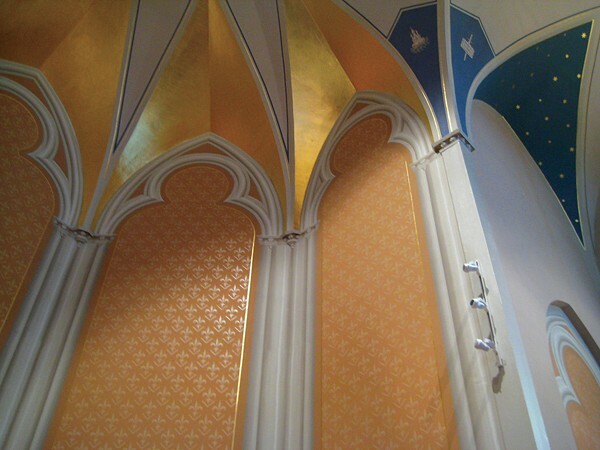 Additionally, the front of the sanctuary features a type of dimensional painting technique called “trompe l’oeil,” (French for “fools the eye”), to give the appearance of real columns. “We tried to keep a semblance of old and new,” said Arnold Goodman, a Holy Family member who is studying for ordination to the Diaconate. “We started out fixing the roof and just kept on going.” About a year ago, cracks showed up in the ceiling. 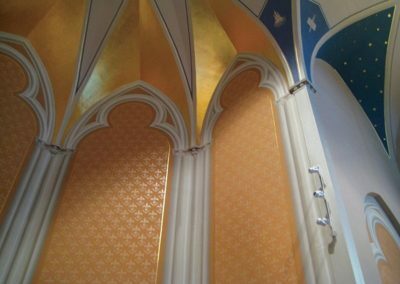 Church leaders decided to freshen up the paint, and so on and so on. Since last spring, worshippers temporarily met across the street from the church at St. Mary’s Hall. Post renovation, the Rev. Frank Patterson, Holy Family’s priest, has seen an effect on the members, which number about 850 families. “I’ve noticed a new energy from the people. Their singing seems to be louder and better. There’s a new enthusiasm as people come to worship,” he said.